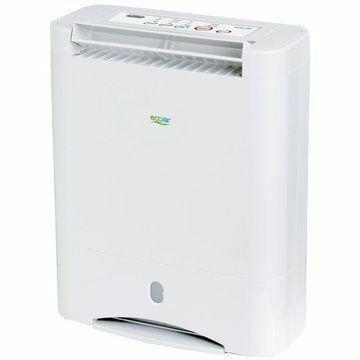 The EcoAir DD322FW Classic tops EcoAir’s desiccant dehumidifier range and is the most powerful domestic desiccant dehumidifier currently on the market. Although it tops the range in terms of power and capacity of the water collection bucket, as you’ll see in this review, there are compromises in terms of a little more noise, size and loss of air purification features, so if you don’t require the extreme moisture extraction power of this machine (ideal if you have a 5-bedroom or particularly damp house) the excellent EcoAir DD128 would be a great alternative. The DD322FW Classic comes fitted with the standard EcoAir digital control panel, which is an array of soft-touch buttons that control individual LED menus for each function and we think is very easy to use. The first button controls the timer settings, with it settable for either two, four or eight hours. This is great for those who do not like or need to use their dehumidifier 24 hours a day but also very useful when combined with the laundry settings if you’re not going to be around (or forget) to turn it off. Moving on to the laundry settings, here are two options to choose from – either ‘normal laundry’ or ‘turbo laundry’. EcoAir recommend ‘normal laundry’ mode for use during the summer time to dry clothes while also energy saving. ‘Turbo laundry’ takes the room to a lower humidity that ‘normal laundry’ before switching into an energy saving mode and so will dry clothes or a damp room much faster and is the recommended option to select during winter. Using the laundry modes will dry wet clothes in about two hours, even in winter. It isn’t recommended that you leave the laundry settings switched on for longer than a few days, so the majority of the time you’ll have the standard dehumidifying settings deployed. Here there are 3 to choose from, either ‘economy’, ‘hi’ or ‘auto’. ‘Economy’ setting deploys the slowest of the two fan speeds only and targets a humidity between 50% to 60% relative humidity, which is the upper half of the 40% to 60%RH ideal range. Once the humidity in your home has been brought under control by a more powerful setting, ‘economy’ would be a great setting to leave the machine on permanently as it is the quietest setting and as you might guess, the most economical too. ‘Hi’ deploys the faster of the two fan speeds to aid air distribution and grant more dehumidifying power and targets a humidity between 40% to 45%RH, which is the more dry end of the ideal range. This mode is great for when it gets below 5°C outside, when a dryer humidity is more comfortable (and is required to stop condensation) or also useful for drying a home or particular room faster. ‘Auto’ setting essentially combines the ‘economy’ and ‘hi’ settings by using a combination of both fan speeds depending how far outside of the targeted range the current humidity is. It targets 50% to 60%RH, the same as ‘economy’, but by utilising the faster of the two fan speeds when necessary it can bring spikes in the humidity (e.g. after cooking) under control much more effectively than ‘economy’ mode. 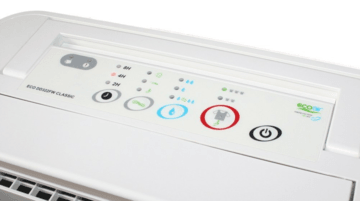 One of the great features about many EcoAir dehumidifiers is the 150° oscillating louvre settings and thankfully the DD322FW Classic also comes with these options aiding air distribution. You can either set the machine to constantly swing in a ‘up’, ‘front’ or ‘wide’ manner or set it to hold one particular angle by holding the button down, which could be useful for blasting a stubborn mould spot. One of the best things about the EcoAir DD322FW Classic is the large 3.5L water collection bucket, as the rest of the EcoAir desiccant range only comes with a 2L bucket, which can be quickly filled and equals many trips to the sink (generally one to two trips per day). This bucket slides out of the front of the unit, so is very easy to access and isn’t fiddly to take out or put back in. The bucket itself has a decent handle and removable lid, so is simple to carry to the sink, even with 3.5 litres of water in it. There’s a viewing window on the front of the unit, so you can gauge how full it is at any one time and there’s a ‘tank-full’ light on the control panel that, you guessed it, illuminates when the bucket is full and therefore the machine has shut itself down. The oddest thing about the DD322FW Classic is why EcoAir didn’t decide to include an ioniser or anti-bacterial filter with it. Maybe this was either a cost or space saving issue? 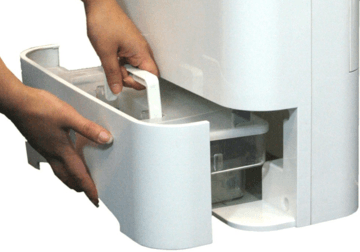 There is a standard dust filter that is easy to take in and out and clean, however. 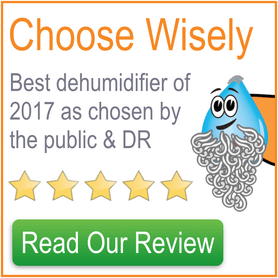 Being the most powerful desiccant dehumidifier currently available, you’d expect some sacrifices to have been made in terms of portability and that is what we see. The EcoAir DD322FW Classic weighs in at 8.5kg out of it’s box, which makes it a few kilograms heavier than other desiccant models, although still lighter than any full-sized refrigerant dehumidifier. The machine is also wide and tall at 41.6cm and 55.0cm respectively, but it is very narrow at just 18.6cm, which helps to make it feel not particularly bulky while carrying it around. There’s the standard top-mounted carry handle that is well designed, although given the tall dimensions, very short people may have to lift their arms up to carry it. Although it’s just a big white box, the matte finish, curved edges and thinness of the DD322FW Classic make it look nice and modern. From a practicality perspective the machine is thoughtfully designed, with an easily accessible front loading water collection bucket, well laid out control panel and easily removable dust filter on the back. Four out of five stars in this criteria is probably a bit harsh, as the DD322FW Classic is quieter than most others on the market, it’s just that probably due to the extra power it is noisier than other EcoAir models that are generally renowned for their quietness. It produces 42dB on the lower of the two fan speeds, which is like a quiet extraction fan, so you probably aren’t going to want it in your bedroom or sitting room, but it would be absolutely fine in a kitchen or hallway. It was easy to score the machine maximum points here as it is a real monster when it comes to stripping the air of humidity. It’s clear that maximising water extraction was EcoAir’s number one priority when designing this machine. As we’ve already said, it’s the most powerful domestic desiccant dehumidifier available and at lower temperatures will beat any domestic refrigerant dehumidifier. 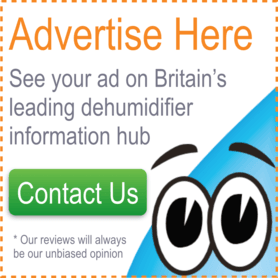 It extracts a whopping 10 litres per day at 20°C and 60%RH and is in no way comparable to refrigerant dehumidifiers that claim to extract 10L per day, as they are measured at 30°C and 80%RH – very favourable conditions that are never going to be found in UK homes. To demonstrate this, under the same conditions that the DD322FW Classic can extract 10 litres, a 10L-rated refrigerant dehumidifier could extract less than 4 litres. Of course the great thing about desiccant dehumidifiers is that you keep this level of extraction right down to temperatures that are not far from freezing. Due to this power, the machine would be more than capable of controlling the humidity of a 5-bedroom house or in a house that has been recently flooded (provided it is reasonably well sealed). It’s clear that EcoAir, to differentiate this model from the rest of the range, have opted for maximum extraction efficiency with the DD322FW Classic and it is very impressive. However, with a good range of functions and a large 3.5L water collection bucket thankfully you aren’t made to compromise elsewhere. This power can come at a cost, although luckily we found a fantastic deal at this store, saving a tidy sum!